This week's busy week of GPU and gaming news Intel took the wraps off of their previously shared graphics panel. 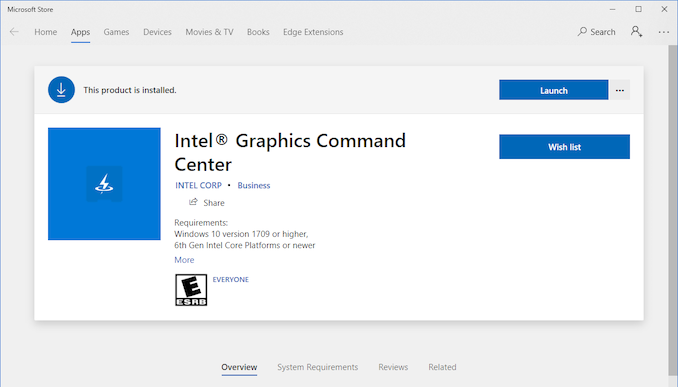 Dubbed the Intel Graphics Command Center – the new control panel app – is an effort from Intel to modernize its graphics infrastructure, replacing the serviceable (but not urgent loved ones) current iteration of the company's control panel. Intel's software stack and overall software ecosystem ahead of the company's ambitious plans to enter the discrete GPU market in 2020. 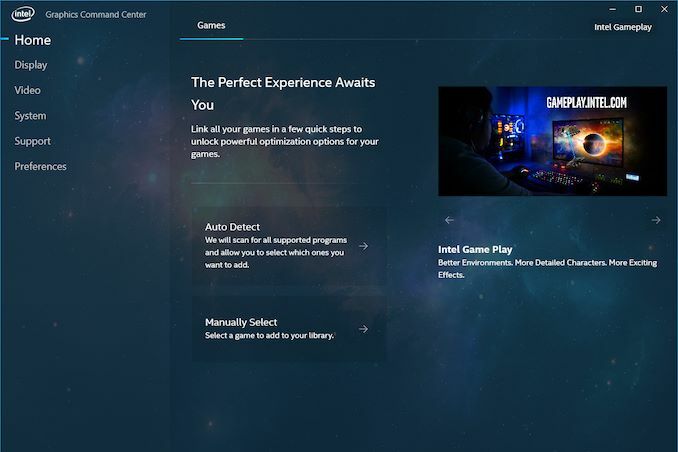 Starting from the top, Intel's Graphics Command Center is now using the same as other modern graphics control panels, as NVIDIA's GeForce Experience and AMD's Radeon Settings application. Which is to say, it's designed to offer a highly visible and streamlined approach to a GPU control panel, making various features easy to find, and overall offering a more user-friendly experience than the company's current control panel. And while Intel does not go as far as to name names, from their presentation it is clear that they consider this kind of user-friendly functionality to be a required, baseline feature for any GPU ecosystem; in which case Intel is (or rather now, which ) the only PC GPU vendor varnishing an equivalent application. But the most interesting thing about the Graphics Command Center is: "It's a little bit too complicated", it's a full-on UWP application with Intel's drivers all of the "modern" flourishes that come with it, and this is actually an important part of Intel's strategy. Because Microsoft's new DCH driver model requires drivers to be stripped down to the bare essentials and delivered in pieces. In which case, using the Microsoft Store lets Intel tap into the OS's built-in software update functionality. It also means that the control panel is not contingent on the checkered driver update schedules of PC OEMs; users can always download the Graphics Command Center out of band. Overall, the Graphics Command Center borrows a lot from other GPU control applications. Front and center is a games-centric approach to settings, with the application preferring to offer game-specific settings when possible (scanning to discover what games are installed). Intel's list of supported games, this is relatively straightforward, and each game gets its own page with familiar driver-enforced settings such as anti-aliasing, v-sync, and anisotropic filtering. Meanwhile, Intel has as well as their performance impacts. A small question mark next to each setting. In the meantime, the attitude towards the current situation is to be determined. Going one step further, however, for 30 of those games, Intel also includes support for one-click graphics optimizations, which is indicated by the lightning bolt logo. Intel's suggested settings for the host computer. This allows Intel to adjust the settings on a fine-grained level, adjusting texture and shadow quality, rendering distance, internal AA settings, etc. I am now in the process of determining which settings are being done by hand by Intel engineers – and of that, I assume a lot of it's being taken out of Intel's existing gameplay settings service. However with 3 generations of iGPUs supported and more coming, the use of automation is increasing as well. Intel makes it pretty easy to undo it as necessary. Beyond game settings, the Graphics Command Center so supports all other common features. There's monitor display settings look for resolution and refresh rates, as well as arranging monitors. There are also a number of video quality settings for color correction, deinterlacing, film detection, etc. Not unlike the graphics settings, there are demo / explanation features here as well, in order to demonstrate in real-time what the various settings do , And of course, there are info panels on the current software and hardware, supported features, etc. This latter part is nowhere near groundbreaking, but this is a baseline feature. Past the current functionality, it's clear that Intel does not consider itself responsible for the development of their new graphics control panel. Besides adding support for more games – both for detection and one-click optimizations – there are several other features the other GPU vendors regularly support such as game recording. Performance monitoring, and game streaming. So I would be surprised if Intel did not move to parity as well. But the launch of their Graphics Command Center is more than just improving the present; it's about laying the groundwork for the future. The company is gearing up to launch it's Gen11 iGPU architecture this year, and all of the common GPU configurations are more powerful than the Skylake-era GT2 configurations. And next year, of course, is the launch of Intel's first Xe discrete GPUs. Intel has grand ambitions here, and to compete with NVIDIA and AMD, they just need to match their software. So their latest control panel is an important step forward in establishing that ecosystem. For the time being, however, Intel is just looking to polish their new control panel. 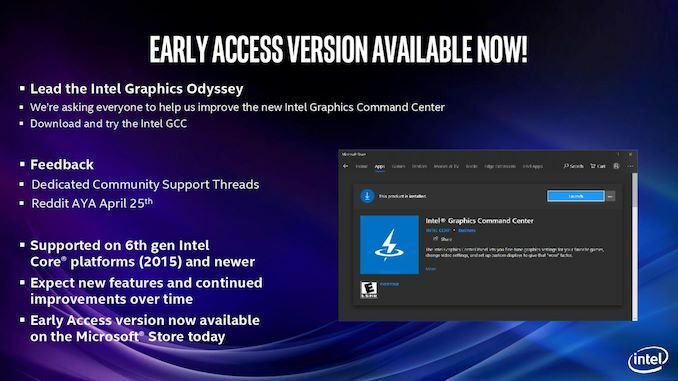 As part of their Odyssey community feedback / evangelism program, Intel is very much embracing the "early access" aspect of this release. And while I admittedly suspected that Intel already knows exactly what they want to do and work on, it certainly does not hurt to solicit feedback on this long road to Xe.